Well it doesn’t get any better on debut to go out and score so convincingly, and to get a great rap post-race from Corey Brown as a future stakes filly! All goes well for her future! The race couldn’t of panned out any better with Corey just sitting wide on the wet track keeping out of trouble and when he asked her to respond she found plenty to sprint away from them at the finish. Obviously Chris will step her up to a better race now and hopefully take advantage of some back end 2 year old racing. Congratulations! 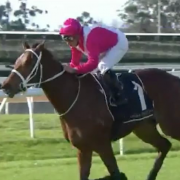 Sydney’s premier trainer Chris Waller has zeroed in on yet another milestone as debutant Bubbles’n’Troubles overcame a wide draw to win impressively at Warwick Farm. The Hinchinbrook two-year-old has edged Waller closer to his 2015-16 season record of 169 metropolitan winners in Sydney by making a perfect start to her career in the Australian Turf Club Plate (1200m). She provided Waller, who has already exceeded his national prize money record for a season, with his 167th winner. After four barrier trials to prepare her for race day, Bubbles’n’Troubles adapted well under Corey Brown on Wednesday. Jumping from the outside gate in the field of 12, Bubbles’n’Troubles ($6) overcame that potential obstacle with ease to control the race from the top of the straight and score by 1-1/2 lengths. Reelem In Ruby, the $2.80 favourite, was second and Singing Sand ($4.80) crossed 1-1/4 lengths back in third. “It was absolutely outstanding. Obviously drawn so wide she had to grab the race by the horns and roll forward,” Waller’s racing manager Charlie Duckworth said. Duckworth realised Bubbles’n’Troubles was capable of making a good first impression when she handled soft ground in her final trial at Rosehill last Friday. Brown had the reins on Wednesday and forecast a bright future. “It wouldn’t surprise me if she’s figuring around the Listed and Group area in 12 months time,” he said. Newcastle trainer Kris Lees trained a double through Feelin The Love and Chalmers, with the latter giving James McDonald an opportunity to salute before his trip to Royal Ascot to ride Equilateral in the Commonwealth Cup.